Discover the contrasting scenery, wildlife environments and cultures of the Maasai Mara, Rift Valley Lakes, the Abedares, Mt Kenya forests and the rugged northern game parks of Samburu and Buffalo Springs. 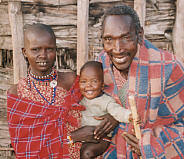 Elementaita dawnOn the way you will experience some of the day-to-day life of the Maasai, Kikuyu and Samburu peoples – visit their villages, homes and farms and be guided by them through their lands and life. The itinerary has been designed to compliment our Kenya Explorer (the first 7 days are the same) and cover a wider range of environments, game parks and cultural experiences - all at a not-too-hectic pace. Hosts at our first campDrive west from Nairobi, stopping for a breath-taking view over the Great Rift Valley, and into Maasailand. Lunch en-route and on to a small Maasai homestead for insights into their fascinating way of life. Overnight bush camp under the acacia trees, dinner round a camp fire, starlit skies and sleep to the sounds of the African night - often lions roaring in the distance. Don't worry - our camp is guarded by armed Maasai all night. Sunset over the MaraWalking safari (not obligatory) through the savannah for wildlife viewing with the Maasai as guides and interpreters of their lands, often strolling amongst giraffe, impala, zebra and wildebeest. Here we support the Enkiteng Lepa Maasai women’s project, a primary school (we arrange visits during term time), and engage in cultural activities with the Maasai. 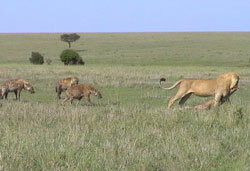 Then on to our secluded camp in the Masai Mara. Overnight in our comfortable permanent tented safari camp (beds with en-suite facilities). Lion dragging a giraffe followed by hyenas Ecologically the Masai Mara is an extension of the great Serengeti plains and teems with wildlife. Up at dawn to spend a full day in the reserve on game drives where you almost certainly will see elephant, buffalo, lion, zebra, giraffe, hippo, crocodile and a whole ark-full of other animals. Rhino, cheetah and leopard are seen on 2 out of 3 visits but our expert naturalist guides and 4WD vehicles ensure you have the very best chance of seeing them all. From July to September, the Mara is home to the great wildebeest migration. Overnight again in our permanent tented safari camp. One of our optional homestay housesEarly start for another game drive, or short hike up Naumare Hill to watch the sun-rise stream over the Mara. 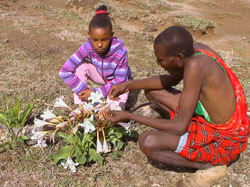 Back to camp for breakfast and then on to a Kikuyu homestead near Lake Elementaita. Exploration of a subsistence farm here and afternoon tea with the farmer and his wife. Option for an overnight stay in a villager’s house for fascinating insights into local life, enhancing your African experience and providing an additional income for the family - no extra cost but advise us in advance please. 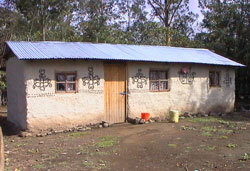 Otherwise on to a comfortable guest house right by Lake Nakuru National Park. Barbeque lunch Drive through Nakuru town, then up past the spectacular Menengai volcanic crater, to a coffee and tea estate co-operative. A delightful, cool, verdant forested setting where there will be a guided bird-watching walk, excellent estate lunch, and visit to the tea and coffee processing operations. You can try your hand at picking tea and coffee if you like (and if you don’t fancy the walk or the tea and coffee processing insights you can relax in the beautiful gardens drinking it). Return to the guest house for overnight. 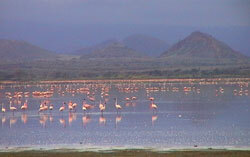 Flamingos on Lake Elementaita Early start for game drive in Lake Nakuru national park. This is a small but spectacularly picturesque park with abundant wildlife and an excellent chance of seeing the rare rhino, both black and white species, lion, leopard, vast herds of buffalo and the unusual Rothschild's giraffe. It has also had nearly 400 species of birds recorded within its boundaries. After lunch a short drive to Lake Elementaita, a soda lake on the floor of the Great Rift Valley, for walking exploration of the lakeside environment and afternoon tea. There are hot springs with amazing heat tolerant fish (accessible if lake water not excessively high) and thousands of pink flamingos and pelicans. 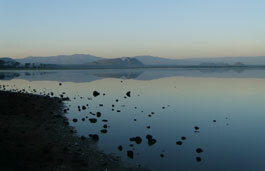 Another short drive to Lake Naivasha for overnight accommodation in chalets right by the lake. 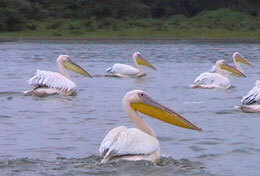 Pelicans on Lake Naivasha - from our boatLake Naivasha is a vast freshwater lake, famed for its hippos and bird life, particularly fish eagles, love-birds and pelicans. At some point in the day you take boat trip to see some of them, disembarking at an animal sanctuary half way to walk amongst giraffe, zebra, impala, gazelle and waterbuck. Otherwise a relaxing day here in the landscaped gardens and acacia woodlands stretching down to the water’s edge. Overnight again in chalets. 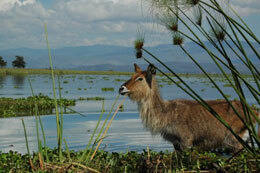 Waterbuck Lake NaivashaMorning exploration of Hell’s Gate National park. Here you can walk (or cycle at small additional cost) amongst herds of zebra, hartebeest, eland, gazelle, with good chances of spotting the rare Lamergeyer vulture, all set against a dramatic volcanic backdrop of soaring lava cliffs, steaming volcanic vents and hot springs. Picnic lunch, and afternoon relaxing by the lake, overnight again in chalets. Afro/alpine moorlands in the AbedaresDrive up through lush Kikuyu farmlands to the Aberdares arriving at Mutubio park gate for an early lunch. 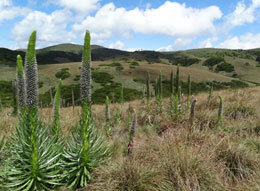 The Abedares Range towers between the Rift Valley and Mt Kenya, more than 4,000 m at its highest point. It is high altitude moorland with spectacular views and much of the strange Afro/Alpine vegetation that is found high up on Mt Kenya and Kilimanjaro. After visits to spectacular waterfalls and opportunistic game viewing around the Treetops salient (lion, elephant and buffalo abound up here), on to lodge accommodation on the slopes of Mt Kenya for overnight. 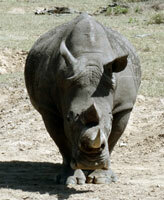 White rhino in SweetwatersEarly breakfast then 45 minutes’ drive to Sweetwaters Game sanctuary. This reserve has a higher wildlife to area ration than any of Kenya’s national parks with all of the “Big Five” (black and white rhino), as well as wild dogs – though they’re not easily spotted. It is the also the only place in Kenya where you can see chimpanzees where a successful rescue and breeding program has saved many from the war torn areas of Central Africa. Back to Mountain Rock Lodge on the slopes of Mt Kenya for late lunch and afternoon nature walk through the virgin forest with bird-watching, colobus and blue monkey spotting. Or relax in the extensive lodge grounds – fishing and horse riding available. Overnight in the lodge. Naturalist guideAn excursion into the montane forest and a morning walk through the towering trees to the Mau Mau caves. Colobus monkeys crash around the branches, scarlet winged turacos flash through the forest canopy and you may see buffalo in the clearings. The Mau Mau fighters used area for shelter during their freedom struggle from the British in the 1950s and en-route our naturalist guide will reveal their forest foods, herbal medicines and survival techniques providing an understanding of the history and ecology of these forests. Return for lunch and afternoon cultural visits to local villages and a school (in term times) of the Kikuyu people living on the lower slopes of the mountain. Afternoon tea on a local subsistence farm, then return for dinner and overnight at the lodge. Samburu elephantsEarly breakfast and drive north across the equator (stopping for the famous demonstration of the Coriolis effect - make of it what you will) to Samburu National Park. Located in the semi-arid Northern Frontier District this area has an atmosphere of mystery and adventure amid a stark and beautiful landscape. 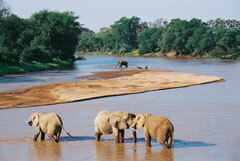 The permanent water from the Ewaso Nyiro river ensures an abundance of wildlife at all times. You'll spend the heat of the day by a pool in a lodge within the National Park and then afternoon and evening game drives. Lodge accommodation overnight within the park. Samburu camel herderEarly start for further game drives in Samburu and Buffalo Springs. 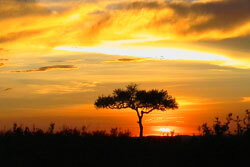 These parks teem with wildlife and some of the unique wildlife species found only here (or further north) include the oryx, Grevy's zebra, reticulated giraffe and the Somali ostrich. 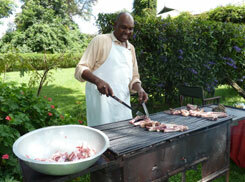 Lunch, then cultural activities in a true Samburu manyatta on the edge of the reserve. An opportunity here to interact with this colourful tribal people and learn about their culture and lifestyle. Drive back via Nanyuki and a stop at the self-help Spinners and Weavers Project with a chance for some souvenir shopping before return to lodge for dinner and overnight. After breakfast transfer to Nairobi arriving before 13.00. This is convenient for most onward travel plans; to the coast, Arusha in Tanzania, or for afternoon/evening return flights. Accommodation is in a fully supported bush camp (1st night), our own permanent tented safari camp in the Mara (2 nights, all en-suite), local hotels, intimate lodges and chalets (10 nights, all en-suite), and optional night in local villager's house (please request details if you’d like to know more about this). We do not generally use the tourist lodges but neither do we compromise on health, safety or reasonable comfort. Mainstream lodge accommodation can however be arranged for private group departures if desired. All necessary equipment is carried in our vehicles, and you only ever need carry a small day-pack with personal gear. When camping on the first night you will not have to participate in camp in camp chores. We buy fresh produce locally and ensure good standards of hygiene. We can cater for special dietary requirements and there are no extra food-kitty payments. We can also arrange airport transfers and accommodation in Nairobi for before and after your trip.